If you’ve been following Alternative Control for any length of time, you know the work of Jim Clegg. 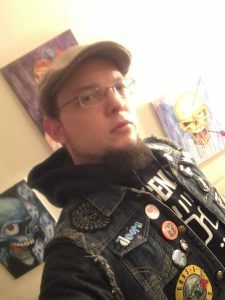 Most recently, he created the epic cover art for our Volume Doom compilation — and over the years, he’s photographed and interviewed the likes of One Eyed Doll, Mother Feather, and Motorhead for the blog. 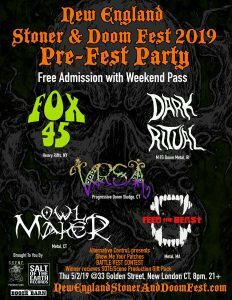 You may also know Jim as a drummer in southern Connecticut’s punk and metal scenes: currently for Lobsterface, Turkey Vulture, and Age Old Nemesis, and formerly for Jimmy Junk Bird, Pink Missile, and probably a few I’m missing. 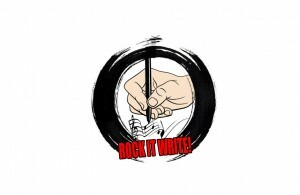 We can all agree that battle vests are themselves creative endeavors… Read on to see how this creative soul approached his! Can I start by saying whenever anyone talks about their battle vest, the scene in Happy Gilmore where the old lady says “My fingers hurt…” always pops into my head. The one I have is I guess “the revised version” and I’m the only one that has it. I have nothing against the original (sported by Jessie May) but as soon as we got them printed, I saw it another way and NEEDED it for myself. 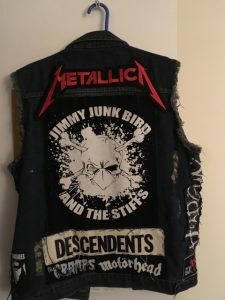 I had three directions I wanted to go in: I wanted to make a punk vest, a metal vest and a movie vest but I also couldn’t walk around with any of them unfinished. It’s argued that a battle vest is supposed to be a “work in progress” but I couldn’t jump on that train. 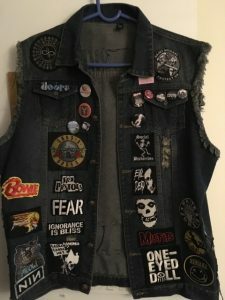 I needed at least a semi-completed vest which made mine a pretty random one! 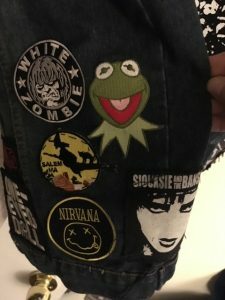 Most of these patches are of bands I grew up listening to and still do along with the Evil Dead movie franchise, Kermit the Frog and some local bands, places I’ve been…it’s all over the place but I like it that way. 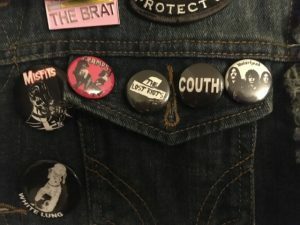 I’d also like to point out the “Couth” pin on the front that was made way back when, I think by Pluckman…you don’t see too many of those around anymore so golf clap to YOU if you have one! 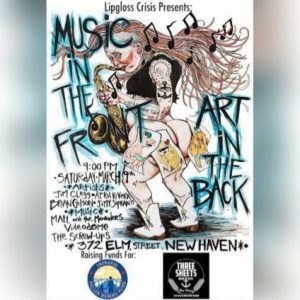 Find more of Jim’s art at Jim.Clegg.art on Facebook and check it out IRL at Three Sheets’ upcoming Art in the Back on March 9th.